Babylonstoren’s particular interest in clivias started four years ago, when Dr Hans Roos gave us clivias from his collection as a gift. 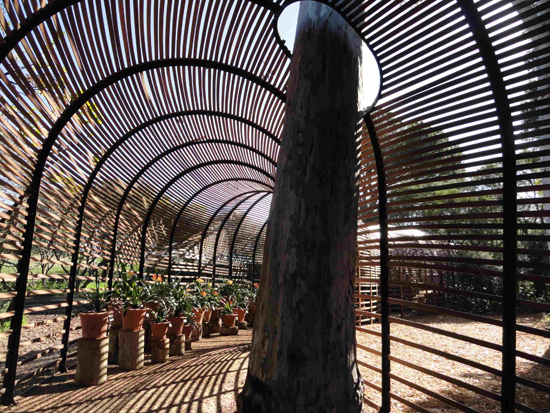 The plants came from his garden in Sandton, where he has been breeding and selecting clivias as a hobby since 1995. 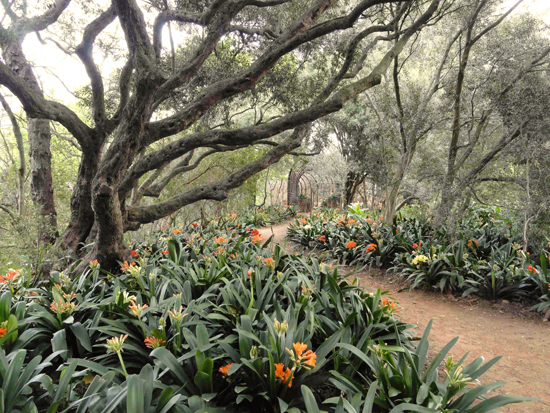 The clivias flourished under the shade of our wild olives and oaks, which inspired Dr Roos to send more plants to create the spectacular walk along the stream, surrounded by thousands of clivias. 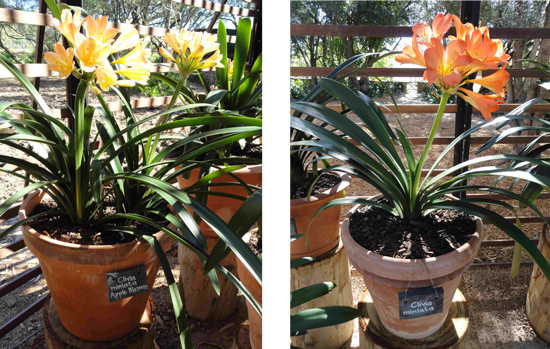 The Mick Dower Clivia collection is a more recent addition, and these clivias in pots are displayed in an undulating shade house known as the Puff Adder, which is a 70 meter tunnel curving through and around huge eucalyptus trees. 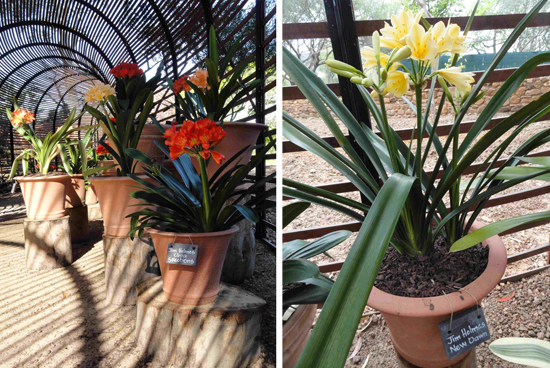 Inside the Puff Adder are special selections that Mick Dower collected over almost 20 years, including species from the wild such as Clivia miniata ‘Appleblossom’, and yellow Clivia Gardenii (below). Suckers off internationally well-known named varieties such as ‘Bronze Bugler’, ‘Apricot Falls’, ‘White lips’ and Nakamura’s selections (below) show the diversity that has been achieved with breeding between species. Mick Dower also made crossings with the recently-discovered species Clivia mirabilis. These seedlings usually have strong hybrid vigour and they show the deep red stem colour of their rare parent. 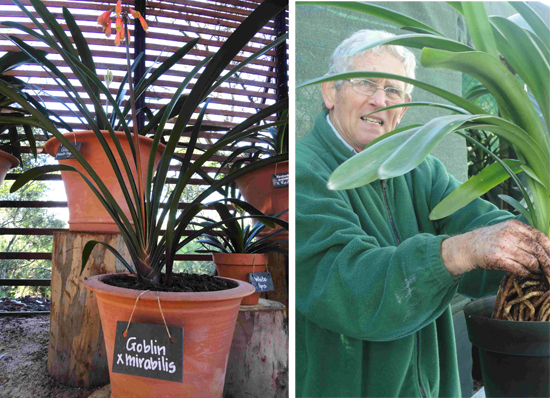 To maintain this valuable collection, we are fortunate to have the help of Mick’s friend and clivia expert John Winter, who was curator of Kirstenbosch from1978 to 1998. 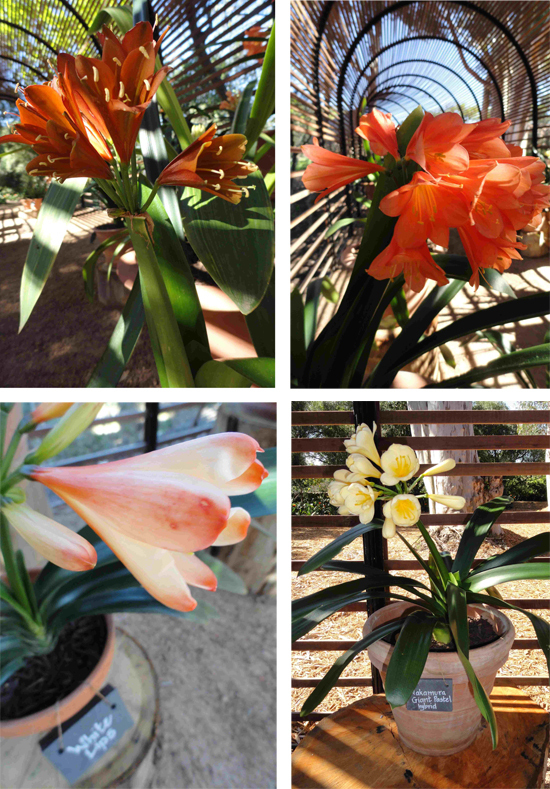 This year we also invited the local clivia breeder Jim Holmes from Stellenbosch to exhibit some of his selections in the Puff Adder – and he brought a selection of interesting miniatures, variegated leaves and different shaped flower heads varying from yellow, peach, orange to deep red. 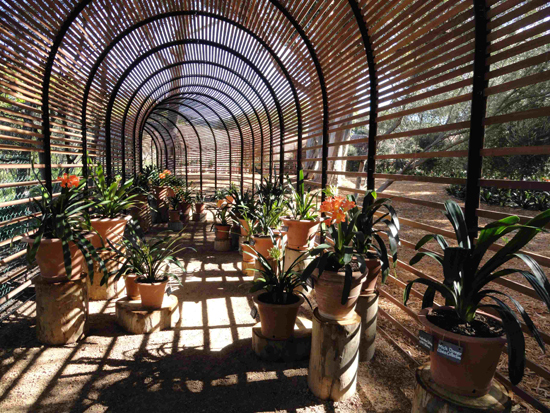 We are looking forward to your visit to our garden to see the Puff Adder and to enjoy our clivia collection. It is not to be missed. Te mooi vir woorde.Lieflike mode kleure wat die natuur ons leer! Dankie Liesl dat jy dit so mooi maak net om te kom en geniet.